Saturday’s Iron Bowl between Alabama and Auburn could be the biggest one in history as the winner advances to the SEC Championship game. Auburn head coach Gus Malzahn has completely transformed a 3-9 team from a year ago into a 10-1 national contender this season. And, Auburn has not forgotten about last year’s embarrassing 49-0 defeat in last year’s Iron Bowl, which was the second-biggest margin in series history. The Tigers are averaging 39.0 points per game this season at 6.4 yards per rush attempt, 8.6 yards per pass attempt and 7.1 yards per play. Overall, Auburn is 1.5 yards per rush play, 1.5 yards per pass play and 1.2 yards per play better than average offensively in 2013. Even more impressive is the fact that the Tigers are garnering 7.3 yards per play at home this season. While Auburn’s defense is not as good as its offense, the Tigers are still good on that side of the ball as they are limiting opponents to 22.0 points per game on 4.3 yards per rush attempt, 7.1 yards per pass play and 5.7 yards per play. At home, the Tigers are yielding just 18.0 points per game at 3.9 yards per rush play, 6.7 yards per pass attempt and 5.5 yards per play. Overall, the Tigers are a solid 0.3 yards per rush attempt, 0.4 yards per pass attempt and 0.2 yards per play better than average defensively. Based on the foregoing analysis, Auburn is 1.4 yards per play better than average from the line of scrimmage (1.2 yards per play offensively; 0.2 yards per play defensively). Alabama, on the other hand, is 2.5 yards per play better than average overall from the line of scrimmage (1.2 yards per play better than average offensively; 1.3 yards per play better than average defensively). Despite the apparent advantage Alabama has from the line of scrimmage, there is still no way to justify installing Auburn as a double-digit home underdog. Auburn is a perfect 6-0 ATS as a home underdog of less than fourteen points and 4-1 ATS following a bye week so the Tigers find themselves in a very favorable spot. More importantly, .251 or greater college football underdogs of three or more points are an incredible 32-6 ATS in their Last Home Game of the season, provided they are playing with revenge. I also like the fact that coach Malzahn is 20-4 SU and 16-6 ATS in his coaching career, including 12-1 SU and 12-0 ATS following a conference game. 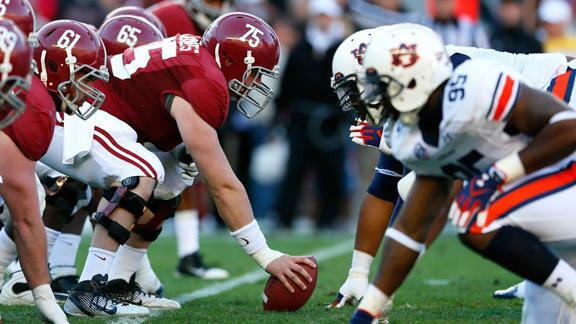 And, the fact that Alabama arrives with an outstanding defense does not detract from our investment as the Tigers are 11-1 ATS at home versus teams allowing less than fourteen points per game on the season (and 21-7 ATS vs. foes yielding less than 310 yards per game). Grab the inflated number and invest with confidence. Technician’s Corner: What we want to do is invest against undefeated college football teams in their regular-season finale if they are favored by 17 points or less and are matched up against a .700 or greater opponent as these teams are 4-20 ATS (17%) since 1980, provided they won ten or more games the previous season.